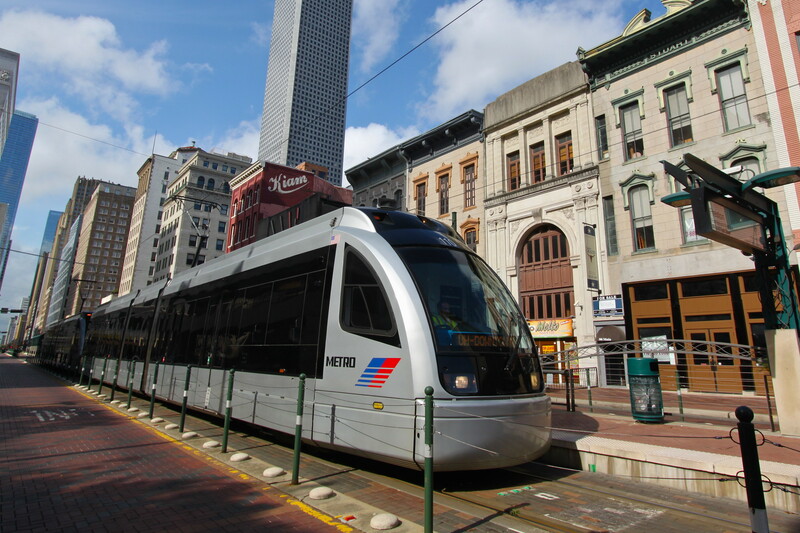 Vertical elements increase separation and prevent incursions on transitways. The level of separation provided depends upon available width, traffic conditions, and local laws or traffic conventions. If compliance is high, softer (or less aggressive) treatments may be adequate to maintain the integrity of dedicated transit space. Additionally, speed, loading, and parking activities may guide application of separation strategies. Ensure placement and height of vertical elements do not impede travel paths or sight lines. 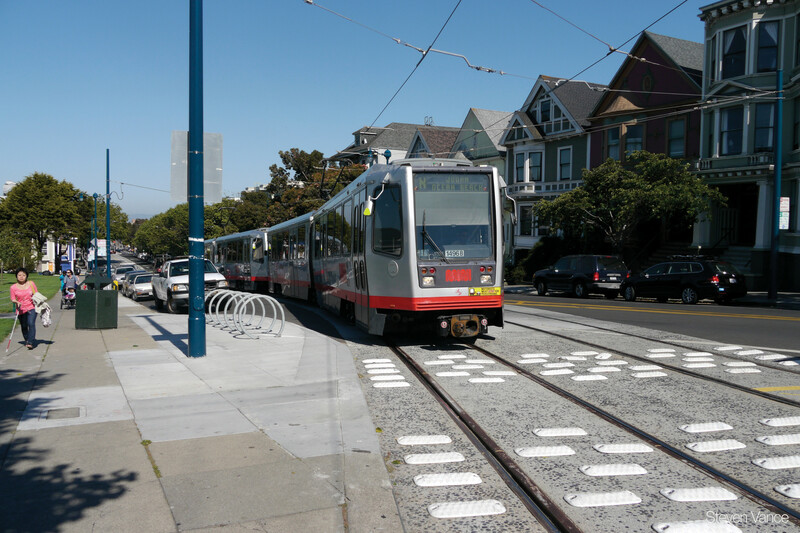 Vertical curbs typically 4–6 inches in height can be installed for limited or block-length sections to physically prevent intrusion into the transitway. Vertical reflective elements can improve the visibility of a hard curb. Require curb ramps at crossings. Curbs less than 6 inches tall can be rounded or sloped to warn other users of dedicated transit space while still providing flexible entry on limited occasions. Curb slope should not exceed 2:3. 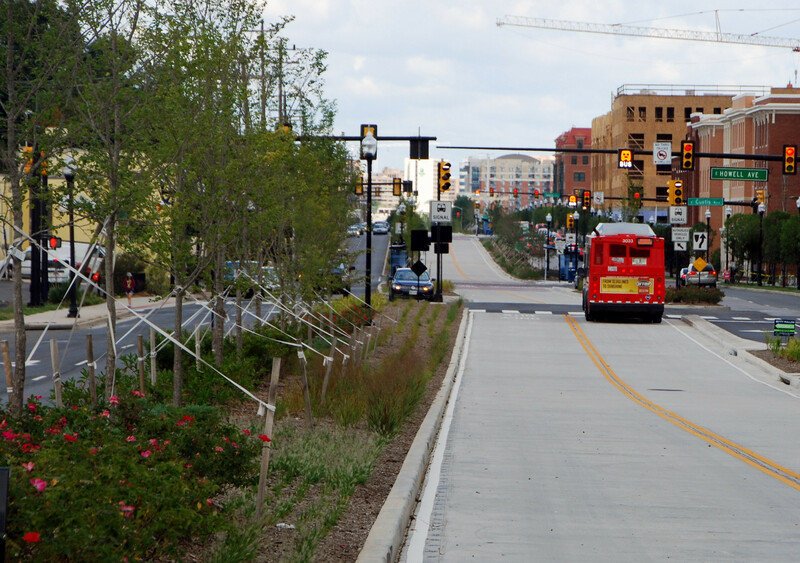 Along the US 1 transitway in Alexandria, VA, a 4-inch mountable curb was included at key locations to accommodate emergency vehicles. “Route 1 Transitway, Docket Item #13.” Planning Commission Hearing, May 1, 2012, City of Alexandria, VA.
To be mountable by bicycles, curb slope should not exceed 1:4. A non-mountable beveled curb with a 1:1 slope creates bike-friendly but not mountable separation. Bicyclists will only be able to cross safely at a perpendicular angle. 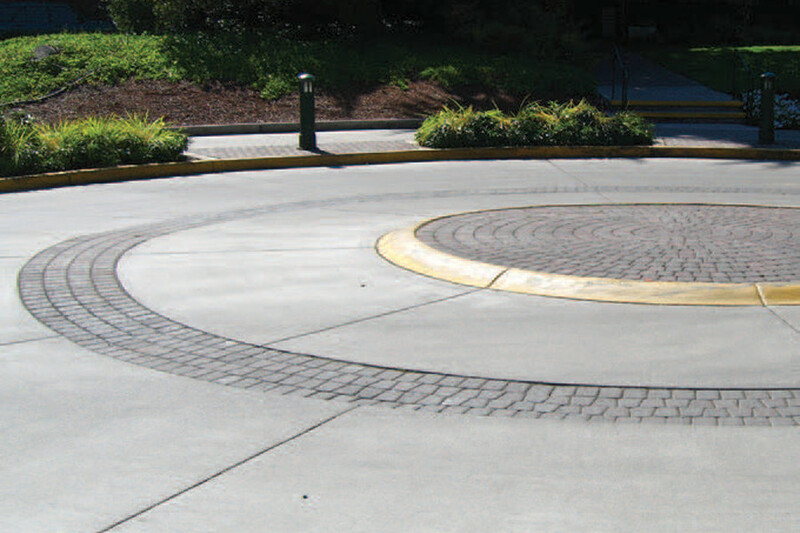 Can be used on corners or roundabouts where a small curb radius is desired for design vehicles, while allowing large control vehicles like buses to mount the curb, creating a larger effective curb radius. Rumble strips are a soft treatment to give a tactile cue to drivers when they encroach upon the transit lane. Where transitways would be dangerous to enter, rumble strips are a low-cost treatment to reduce vehicle incursions. These are typically reserved for high-speed streets, as they are neither safe nor comfortable for bicyclists or wheelchair users to cross, and are not as effective at restricting incursions as other treatments. Rumble strips must not extend into pedestrian areas like crosswalks. 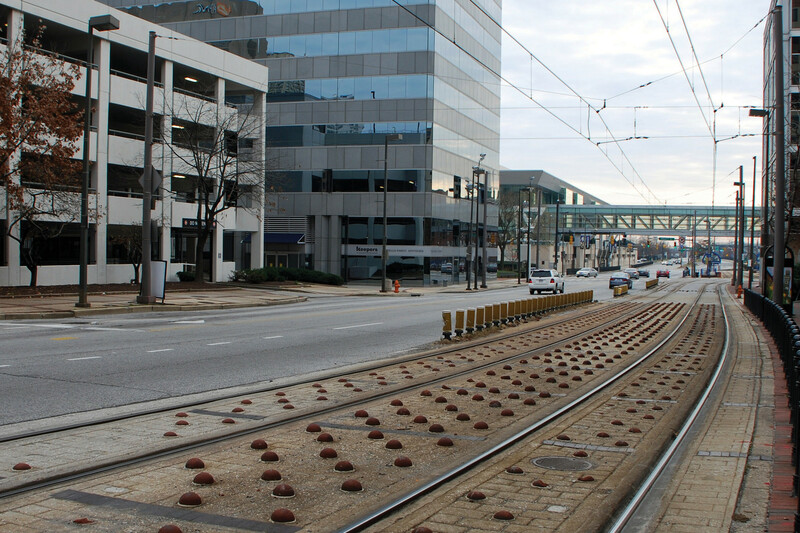 Vertical elements like bollards, concrete domes, or plastic “armadillos” provide visual and physical lane delineation. Bollards should be 30–42 inches in height to achieve full visibility. 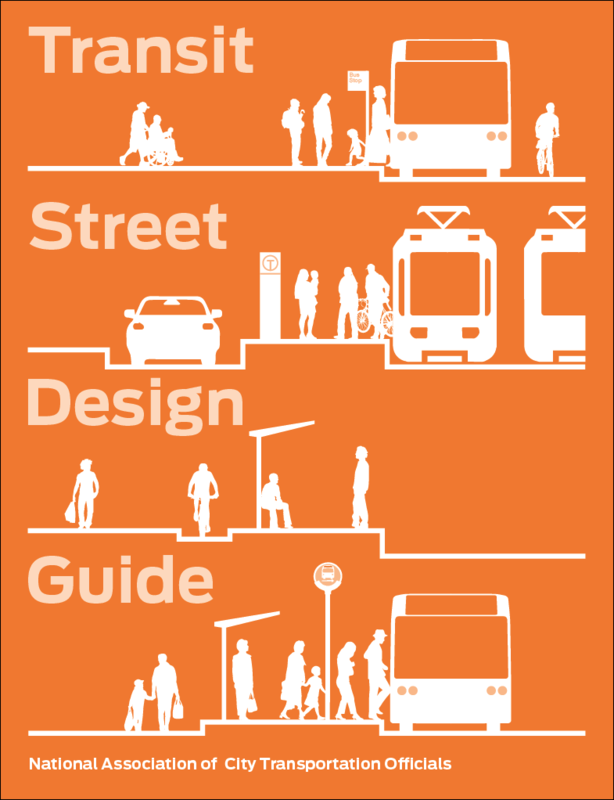 Better Streets Plan: Policies and Guidelines for the Pedestrian Realm. City & County of San Francisco, Planning Department (2010). Many types of bollards are available in a range of costs and designs, and can be integrated into the streetscape. Assess design speeds, urban design guidance, and contextual characteristics to determine bollard design and style. Fixed bollards must be adequately anchored to absorb forces from vehicle impacts. Bollards must be readily visible and include either retroreflective surface or lighting elements. Bollards may be applied for full block segments or at specific locations where warning is desired. Low concrete domes can be applied to existing streets and provide both a visual and tactile cue to drivers to prevent incursion. Plastic “armadillo”-shaped elements are an easy-to-install alternative. Markings should be used to clearly delineate the presence of raised domes. 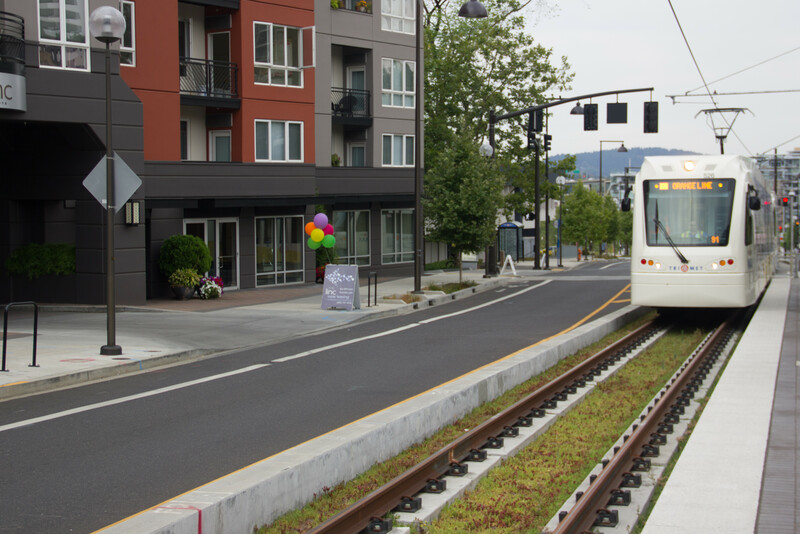 Planting strips enhance the streetscape while providing vertical and horizontal separation. Plantings require additional space and maintenance. Xeriscaping may provide an attractive low-maintenance alternative. Plants must not block sightlines or impede the running way. 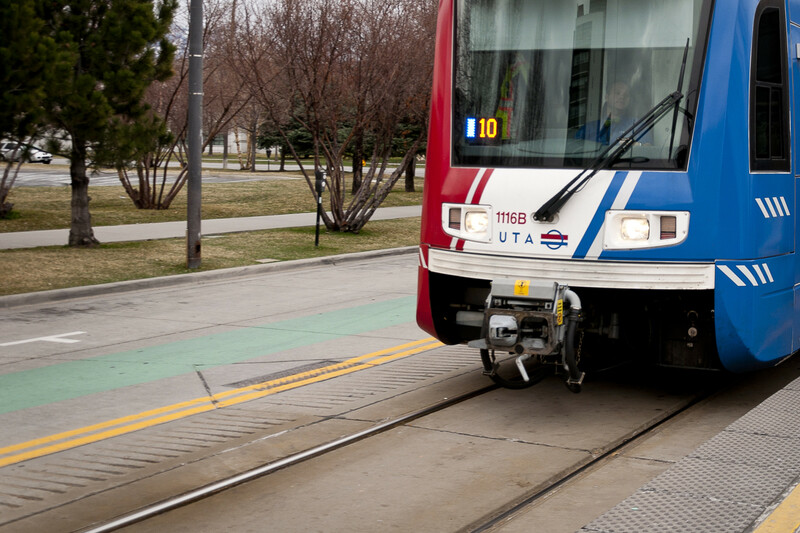 Maintain some clearance between plantings and travel lanes or transitways where possible, or use plants that grow vertically without trailing. Shrubs require regular trimming and may not be desirable where clear sightlines are required. 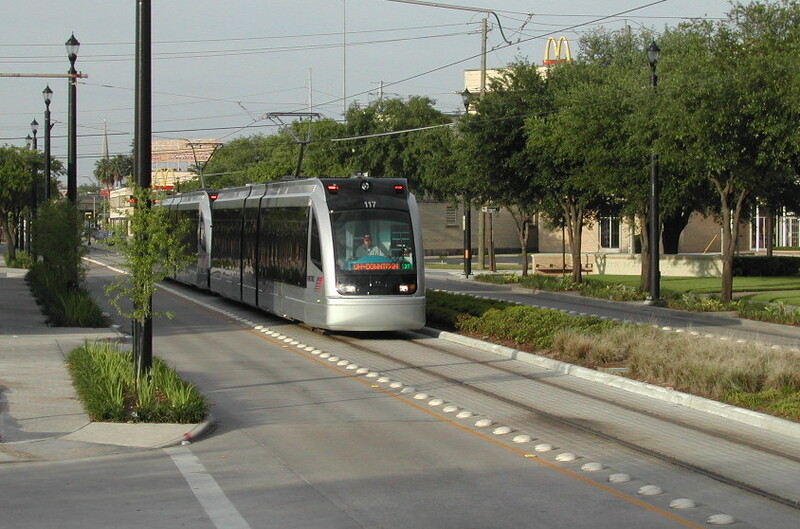 However, trees and shrubs are often suitable on fully separated transitways. Trees that drop leaves, particularly all at once in the fall, can create slippery conditions for both bus and rail vehicles. Avoid plantings that might grow to encroach on intersections to ensure pedestrian access and safe interactions with vehicles. Bioswales and connected planters assist with stormwater management (refer to the Urban Street Design Guide). Short vertical elements can be installed across a rail transitway or lane to deter general motor vehicles from entering. Elements must not intrude into pedestrian spaces such as crosswalks. Movable planters offer the flexibility of being easily reconfigured or removed. Self-watering planters capture more stormwater and require less care.